This masculine card is for a friend of ours who loves nature and has a beautiful garden. Unfortunately, I struggled with the photography with the gorgeous copper shine and I have to say that the card is much more handsome in person! This card is entered into this week's Crazy Crafters Project Highlights which you can visit here to see all the great projects and vote for your favourites. 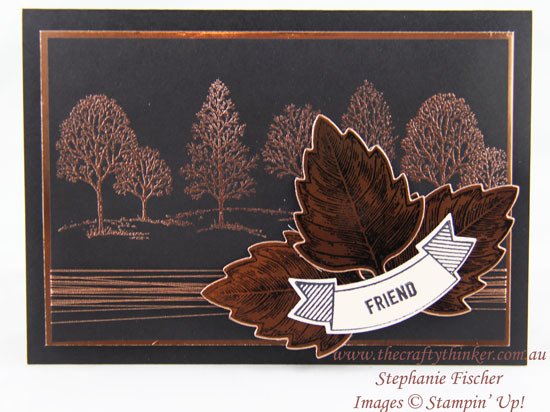 My all-time favourite stamp from Lovely As A Tree is heat embossed with the gorgeous copper embossing powder. I filled the foreground by wrapping Copper Metallic Thread around the card many times. I stamped the leaf image onto Copper Foil Sheet with Stazon ink. The banner is from the Thoughtful Banners stamp set and is stamped in Basic Black ink onto Very Vanilla cardstock (although it has come out looking a bit white in the photo).